Loss – Tammi B. Ph.D.
Loss, is never easy, especially if we have a strong attachment to someone or something. 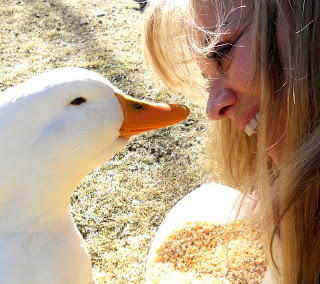 I recently lost my duck Afflack (affectionately known as Flacky by my family and me) and spiraled into grief. I knew he wasn’t much longer for this world. My research revealed that Ducks tend to live 7 or 8 years and he was at least 7. Arthritis contorted his legs and feet and made it difficult for him to walk. As I watched him stumble around the pond towards the end of his life, my eyes would fill with tears. It is painful to witness those we love struggle. However, loss and pain is a part of life on planet Earth, and as much as it hurts, if we can make friends with these experiences, (or at least relax our resistance to them) the tears, hurt, and grief can flow through us, rather than get stuck in our physical, mental and emotional bodies. One thing is for sure, everything here is temporary. I have the image of us as a part of a cosmic soup, part of Spirit. We bubble up and put on our skin, fur or feather suits; we play and flail about for a while, then bubble back into Spirit. But from this side of the bubbling, it feels like a great loss when someone dissolves back into that other realm. A few years back I lost a dear friend to suicide. I knew he had been in great pain and thought I could help soothe his angst. When he made that decision, not only did I feel like a failure as a friend, I felt like I had lost a touchstone to love; the same feeling I have now with the loss of my duck. My friends were worldly representations of love, and when they were suddenly gone…I felt they had taken my love with them. This is the core of grief – being separated from love. The Course of Miracles say, only the love is real, everything else is an illusion. So whether we are losing a friend to death, divorce or otherwise, only the love matters…only the love is real. My friends may no longer be here in physical form for me to hug, but they still do exist and so does the love. I occasionally feel the sting of tears at the back of my eyes but unlike certain losses from my past, I don’t resist the tears. I let them flow through me, and I consciously connect to the love, respect, gratitude and reverence in my heart for these special beings. My tears have become like free flowing prayers. So today I celebrate my friends, those still in physical form and those who have blended into Spirit. I am also rinsing my soul off in the process. If you are reading this, I want to thank you for being a part of my Earthly experience. Let’s flail, dance and play for a while, and let’s allow the tears flow when they present themselves. And may you experience a whole, loving, rich, and fully-lived life.